Particle 3D have amazed the jury panel with their disruptive idea and received a great deal of attention as they were proclaimed the HealthTech and overall winners of National Startup Competition 2017! We had a talk with Casper Slots, the CEO of the company, and want to share their success story with you! The team consists of three founders and one commercial consultant. Casper Slots. Co-Founder, CEO. Casper holds a MSc. (Eng.) In Health and Welfare Technology with research experience in material science and development, tissue engineering and drug delivery, all in the fields of 3D printing. Martin Bonde Jensen. Co-Founder, CTO. He has experience in modeling in 3D using CAD, and converting these models to additive manufactured models, and has contributed to development and operation of Particle3D’s collection of 3D printers. Morten Østergaard Andersen. Co-Founder, CSO. Morten is an Associate Professor at the Section for Biotechnology at the Faculty of Engineering at the University of Southern Denmark. Anders Rosenkrands-Lange. Commercial Consultant. Anders holds a MSc. business law and business administration and is Team Leader in Value Creation at Bloomberg LP. in the greater New York area. 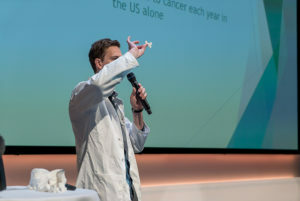 Particle3D is a biomedical engineering company that is currently in the process of developing human bone through 3D printing for use in surgical operations. Today, people who need bone replacement – either because of accidents or illness – can have a synthetic implant such as titanium, a donor bone or, they can harvest bone fragments from their own body to replace the missing bone. None of these solutions are optimal and usually have high complication rates. Particle3D uses a combination of computer aided design and a bone-like material to 3D print bone implants that are so lifelike, they are cheating the body. How have you started Particle3D and what motivated you? 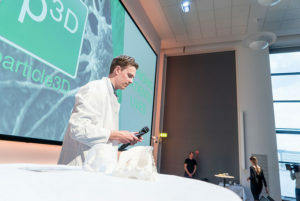 Particle3D is a spinout company from the University of Southern Denmark and is founded by Casper Slots, Martin Bonde Jensen and Morten Østergaard Andersen. ▪ June 2017 Won Venture Cup National Startup Competition. Surgery at Odense University Hospital (OUH). He wanted us to come up with an implant solution for replacing destroyed or surgically removed bone in the face and jaws of his patients as current solutions performed poorly. 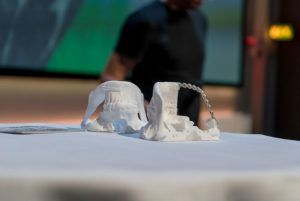 The ideal solution should be patient fitted for example by 3D printing it, using scanning data as a guide and it should degrade slowly after implantation to be replaced with natural bone thus restoring the patient’s tissue to both its former shape and composition. Martin Bonde Jensen and Casper Slots, two engineering students, were recruited to work on this project for their bachelor thesis. This resulted in the development of a particle ink that could be 3D printed into a wide variety of personalized and resorbable implants. This technology was a novel and much better solution compared to the current solutions. What are the biggest hurdles to building your company and how are you planning to overcome them? We have just had a meeting with SDU to discuss countries to which it would be relevant to expand. The USA is particularly in the spotlight as the American market in medical devices is among the largest in the world. However, it requires major financial ballast to penetrate a market such as this. We have to go through FDA, food and drug administration, which requires funding that is not in place yet. What did it mean for you to be the HealthTech category and overall winner at NSC17? One might think that winning the first prize of the Venture Cup and its accompanying check would provide an excuse for the popping of champagne corks, but for now we have not really had the chance to celebrate it. We did however celebrate the victory by sharing a bag of caramels, the day after. However, I predict that the triumph will be properly celebrated when we go to Silicon Valley. Because it is definitely something worth celebrating. How has winning the competition helped you? 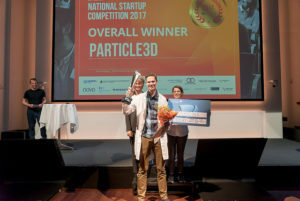 The money has made it possible to go from a university project to starting a real company, Particle3D, this summer, which will be very exciting. 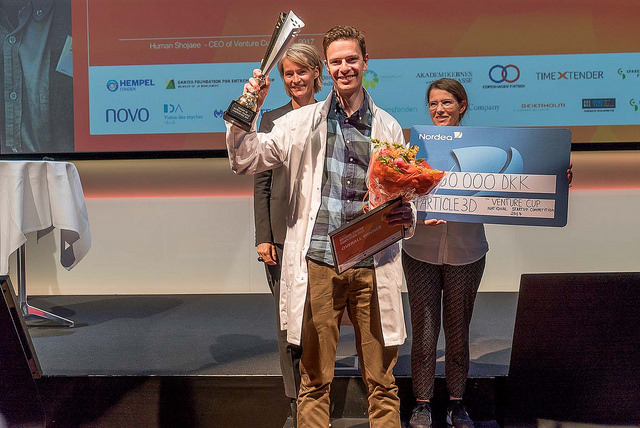 But winning the Venture Cup victory is about more than just money it has been a massive pat on the back for us to receive this kind of recognition, and as a result it’s given us a lot of PR as well as contacts both in Denmark and internationally. Can you give some advice for young entrepreneurs? I can’t remember who said it, but there is a saying: “a journey of a thousand miles begins with a single step” which have made a lot of sense for us in our process. How does the future look like for you and your startup? The future looks bright and exciting as Particle3D are preparing larger animal and clinical trials later this year. Learn more about Particle3D and their startup journey since 2017 here! If you are a university student working on a startup, check out our National Startup Competition. You can boost your network, receive feedback from business professionals and win DKK 120,000!